Go ahead, take a bite… Lesbian Zombie Crush – Act I, Crossing Over Nancy Novak is running; running from who she may be, her past, which comes in flashes, and what is right in front of her, horrific creatures on a ravage hunger feast. And those who find themselves with super human strength. 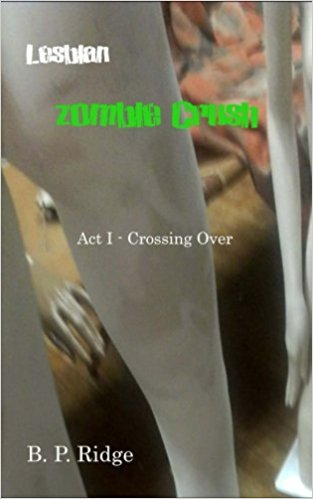 Is the one who chose to make her, her own, a new kind of crush, or not your normal Zombie creation. Someone has bitten her and she can’t turn back. B. P. Ridge was born and resides in Texas. B.P. writes light horror fiction, which mostly takes place in Texas and in and around the border of South America. As a youngster B.P. has loved reading about vampires, mummies, zombies, and most ghoulish stories as I hide under a blanket. When her family got their first television set, you might find B.P. up late watching films about them all, that is until a creaking door sent them back to bed.